What’s causing my back pain? It’s a common question, and a visit to your doctor is an important first step to get an answer. Any patient suffering from back pain or radiating leg pain should be examined by a doctor. The history of the pain and any activities that may have triggered your symptoms are important factors in diagnosis and treatment. The spinal column is one of the most vital parts of the human body, supporting our trunks and making all of our movements possible. When the spine is injured and its function is impaired the consequences can be painful and even disabling. According to estimates, 80 percent of Americans will experience low back pain at least once in their lifetime. A small number of patients will develop chronic or degenerative spinal disorders that can be disabling. Men and women are equally affected by lower back pain, and most back pain occurs between the ages of 25 and 60. However, no age is completely immune. Approximately 12% to 26% of children and adolescents suffer from low back pain. Fortunately most low back pain is acute, and will resolve itself in three days to six weeks with or without treatment. If pain and symptoms persist for longer than 3 months to a year, the condition is considered chronic. Humans are born with 33 separate vertebrae. By adulthood, most have only 24, due to the fusion of the vertebrae in certain parts of the spine during normal development. The lumbar spine consists of 5 vertebrae called L1 through -L5. Below the lumbar spine, nine vertebrae at the base of the spine grow together. Five form the triangular bone called the sacrum. The two dimples in most everyone’s back (historically known as the “dimples of Venus”) are where the sacrum joins the hipbones, called the sacroiliac joint. The lowest four vertebrae form the tailbone or coccyx. 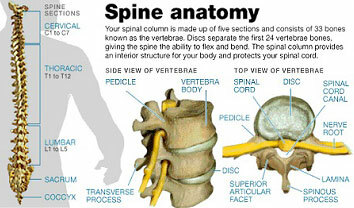 The anatomy of the spinal column is extremely well designed to serve many functions. All of the elements of the spinal column and vertebrae serve the purpose of protecting the spinal cord, which provides communication to the brain, mobility and sensation in the body through the complex interaction of bones, ligaments and muscle structures of the back and the nerves that surround it. The back is also the powerhouse for the entire body, supporting our trunks and making all of the movements of our head, arms, and legs possible. The information on this web site is for your general educational information only. Please contact Spine Works Institute for proper diagnosis and treatment.